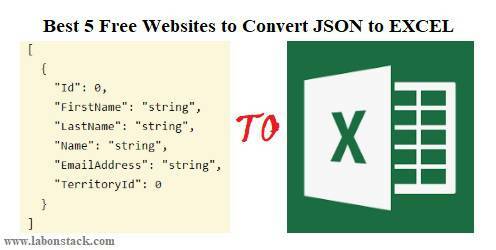 In this article, I have listed Best 5 Free Websites to Convert JSON to EXCEL. Using this website you can easily convert JSON into Excel. To convert data you just need to paste or upload a JSON file and then convert it to Excel file. Here some site converts JSON to XLSX format and some sites convert JSON to XLS. All this JSON to Excel Converter website have many interesting features. Like, they show you JSON and edit JSON before you convert it, add URL of online JSON, JSON to CSV and many more. One more thing I want to say you that here some of the websites cannot convert nested JSON arrays to Excel, but normal JSON data can be converted very easily. CodeBeautify is developed for Beautify, Minify, Convert your code/data for your expected result. This is a whole suite and they provide many other converters and editor. You can use it without any account or by creating a free account. JSON to Excel converter is one of their best tools. They provide other converters also like, you can use XML to JSON, Word to HTML converter, CSV to HTML, SQL to CSV, Energy Converter, and more. When you convert JSON to Excel using this tool you can upload JSON up to 1 MB from PC or you can create JSON file from scratch. After uploading the file you need to select the output format as XLSX or XLS and click on the Convert button. This tool is used to convert JSON into CSV (Comma Separated Values) or Excel. Here also you can add JSON data three-way, upload JSON from PC, add JSON file URL or paste JSON data. You can view and edit JSON before generating the output. check if output has come as expected. Once the output data is ready, you can download it as CSV and/or XLSX format file. This website is best to convert JSON into Excel. You can get output Excel file is generated in XLSX format. Its feature is you can view JSON before convert it. In the free plan, you can upload up to 1 MB JSON file from PC. Or else you can add a JSON file URL or create JSON data from scratch. After that, you can save the output as CSV and/or XLSX. This tool provides some option to set for convert JSON to Excel like you can column order (original order or smart ordering), set delimiter (semicolon, pipe, tab, or comma) etc. You can use this options and convert JSON to Excel. Beautify Converter website is a good option to convert JSON to XLSX. Here you are not able to convert some JSON files which were converted with other sites easily. So check this website convert your JSON files into Excel. If converted then good. They provide many other useful features like you can view and edit JSON data, beautify JSON data, enable wrap mode, download output as CSV, load JSON file from PC or add online JSON URL, and text file. All these features are very good. This is also a very useful JSON to Excel converter tool. You can view JSON and output data side by side as well as edit it, this is the unique feature of this website. The output data can be downloaded as XLS and CSV file. You can set the separator (comma, semicolon, or tab) can also be set for the input data. Using this separator you generate output with expected data. Otherwise, it might not generate the correct result.